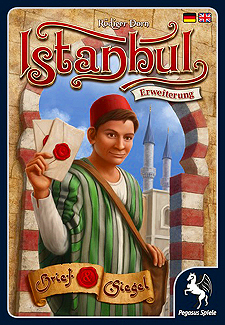 Only playable with Istanbul, the Kennerspiel des Jahres 2014! Five new places providing additional options in the hunt for rubies! Deliver letters to the embassy and use the interactive actions at the auction house and kiosk to your advantage. With a companion by your side, you have a competent partner who can act independently from your merchant. Can be combined with the Mocha and Baksheesh expansion!